Can I buy upgrades more than once? I can't buy pizza fuel!!! Why do you use ads? The ads you can see generate money to cover the hosting costs. It wont let me buy x, help? Remember to click sell all pizzas dummy. A slave is used to run pizza makers and can be used as a pizza delivery driver. A cleaner is used to clean up all the mess the slaves make. A manager makes sure all the slaves and cleaners are working. An operator makes sure all the slaves are building the machines correctly. A scientist figures out the complicated stuff. An astronaut helps with all the space things. You need a cart to run a pizza cart duh. Can't run a pizza van without a van. Try opening a parlour with no parlour. It helps to have a restaurant when running a pizza restaurant. Not an actual palace, it's a clever name for a fast food place. God. How can you make a pizza factory without a factory? Guys lets make a pizza converter. Scrap metal is used for machines and above. Shall we build a pizza weather machine? You can't get to the moon without an elevator. Why the hell do you need a moon base for pizzas? Who even has time for clicking? Urgh. You're lucky I'm a generous God. Unlock +10, +100, and +1000 Buttons for a few resources. Unlock +10, +100, and +1000 Buttons for a few more resources. $100,000,000 to click a button 5 times. Worth. Unlock +10, +100, and +1000 Buttons for that last stupid resource you need. Your pizza per second is doubled, including your click. 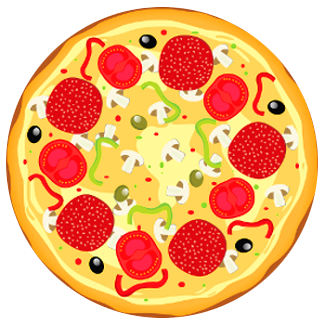 Your pizza per second is doubled again, including your click again. Your pizza per second is doubled again again, including your click again again. Your pizza per second is doubled again again again, including your click again again again. What a nice and simple pizza. Pizza can now be sold for $2. Adding some chicken, I like it. I take it you're not a vegetarian? Going for the mighty meat feast then. A worker that makes pizzas for you. Lazy. A pizza cart that wanders the streets making pizza. Cost = $200, 1 Slave, 1 Cart. A pizza van that drives around making pizza. Cost = $500, 2 Slaves, 1 Van. A pizza parlour makes pizza indoors. Cost = $2,000, 3 Slaves, 1 Cleaner, 1 Manager, 1 Parlour. A pizza restaurant where only the highest quality of pizza is made. Quite. Cost = $10,000, 8 Slaves, 2 Cleaners, 1 Manager, 1 Restaurant. A pizza palace makes fast deliverable pizzas (Not a palace made of pizza that makes pizza...). Cost = $50,000, 16 Slaves, 4 Cleaners, 2 Managers, 1 Palace. A pizza factory mass produces pizzas. Cost = $200,000, 32 Slaves, 8 Cleaners, 4 Managers, 1 Factory. A pizza converter converts ordinary objects into pizza. Cost = $1,000,000, 64 Slaves, 16 Cleaners, 8 Operators, 4 Scientists, 10 Scrap Metal, 1 Converter. A pizza weather machine makes it rain pizza 24/7. Cost = $25,000,000, 128 Slaves, 32 Cleaners, 16 Operators, 8 Scientists, 20 Scrap Metal, 1 Weather Machine. A super drill mines the earths core for tomato sauce to make the best pizzas. Cost = $500,000,000, 256 Slaves, 64 Cleaners, 32 Operators, 16 Scientists, 30 Scrap Metal, 1 Super Drill. A moon base collects the cheese from the moon and sprinkles it on pizza. Cost = $1,000,000,000, 512 Slaves, 128 Cleaners, 64 Operators, 32 Scientists, 16 Astronauts, 50 Scrap Metal, 2 Space Elevators, 1 Moon Base. A rocket ship that is fueled by pizzas to explore space. Supply a crew to undertake a historic expedition into space. Cost = 5000 Astronauts, 5000 Scientists. Donate your pizzas in order to advance our understanding of space. Your name will be remembered throughout history. Take your crew and go and discover the untold wonders of our solar system. Cost = 1 Rocket Ship, 1 Fuel, 1 Crew.